In December, Bolt heads to Big Sur on the Pacific Coast. Get ready for an overlanding expedition through some of the most spectacular scenery on Earth. your spot in a Toyota 4Runner or Jeep Wrangler - you’re welcome to drive or ride along! 3 delicious breakfasts and 2 tasty dinners, cooked together. Each night, gather around the campsite for hot food, cold drinks, and maybe even a ghost story or two. endless games of Cards Against Humanity©. We’ll depart from Fort Point, just under the Golden Gate Bridge in San Francisco, CA. SFO is 15 miles south of the city, and easily accessed with direct flights from airports around the country. Need an airport pickup on Friday mid-day? Let’s chat. 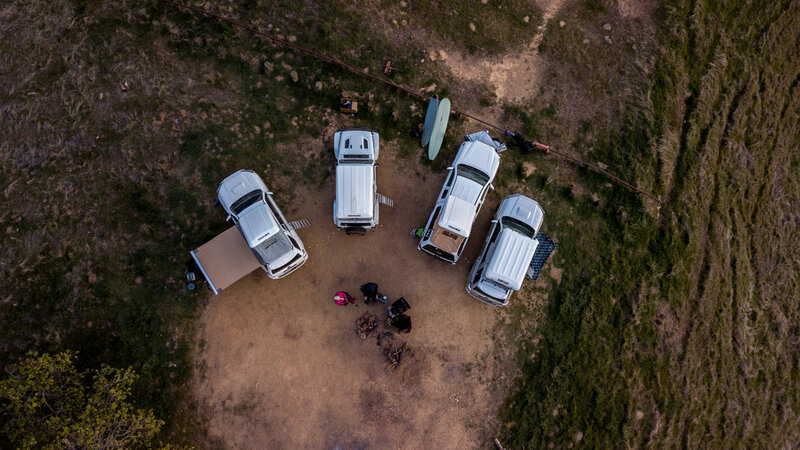 overlanding vehicles on a mission down the coast. Drive by day and pop the rooftop tent by night. A new campsite every night, complete with Delicious food and epic hangs. Jeeps. 4Runners. Rooftop tents for days. R & R At your own speed. This December, we’re partnering with our friends at Pacific Overlander for a journey down Highway 1 through Big Sur. This isn’t just a drive down the coast, though - we’ll be venturing in roof-top-tented, 4WD-equipped, fully-kitted-out Toyota 4Runners and Jeep Wranglers. We’ll meet up Friday for breakfast in Fort Point, San Francisco before starting out south for a weekend of wonder and discovery. This’ll be a mix of individual vehicle travel and caravanning, stopping at your leisure for photography, hikes, oysters, brisk water dips and croissants from Big Sur Bakery. In true overlanding spirit, our itinerary is rough, but count on a sunset at Pfeiffer Beach (hopefully with a bit of sun peeking through the keyhole) and great campsites. Four wheel drive and high clearance give us access to often-overlooked parts of the coast. By day, choose your own adventure - a relaxing beach vacation with book in hand, or tackle some of the great hikes across the parks. We’ll have a beach station set up with snacks, cold drinks, Spikeball, and more. On Saturday, we’ll have a full suite of wetsuits and surfboards if you’d like to paddle out - December is the Pacific Coast at it’s most pumping. By night, we’ll meet up at campsites for delicious food, cold beers, and plenty of time for late-night hangs. Alongside the vehicles’ rooftop tents, we’ll have camping gear - just bring a sleeping bag. December in Northern California means shorter days and longer nights, so expect early wake-up calls to make the most of that precious sunlight. Ready for an adventure down the coast? Copy of Want to join? Sign up here and we'll send you an email once in a blue moon with the latest Experiences and tales of adventures past, present, and future.